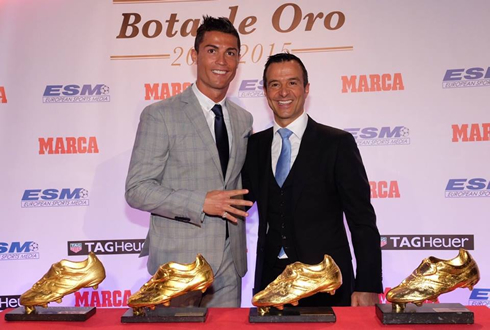 ﻿ Cristiano Ronaldo: "I evolved into a different type of player"
14.10.2015 » Cristiano Ronaldo: "I evolved into a different type of player"
Cristiano Ronaldo is the first player in the history of the game to collect 4 European Golden Shoes and he decided to celebrate the occasion by granting an interview to MARCA in Spain. 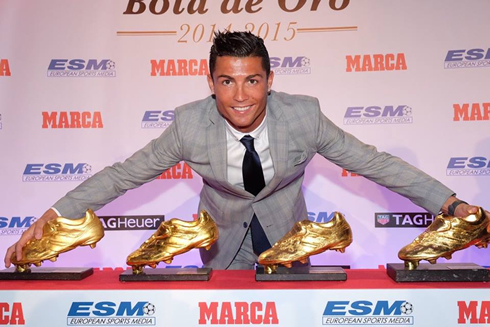 No other player since 1967 has won as many European Golden Shoes as Cristiano Ronaldo. The Portuguese star received his 4th trophy of this kind earlier this week, which awards the top scorer in Europe every single season. Barcelona's Lionel Messi is right behind him with 3 trophies, but his recent knee ligament injury will keep him sidelined in the upcoming weeks/months and certainly impact his chances of challenging Ronaldo in this particular goal-scoring race. 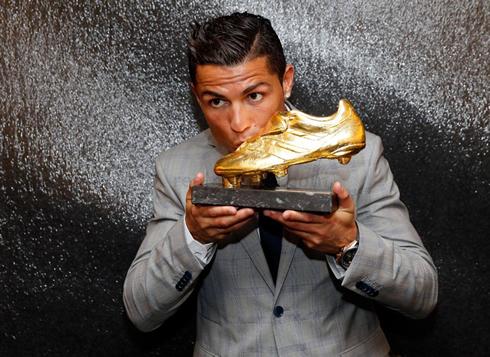 As a way of celebrating this unique achievement, the Real Madrid forward agreed to answer a few questions after the ceremony and among many things, he revealed that he's not thinking about slowing down just yet and that he'll do everything in his reach to win a 5th and 6th Golden Shoe. 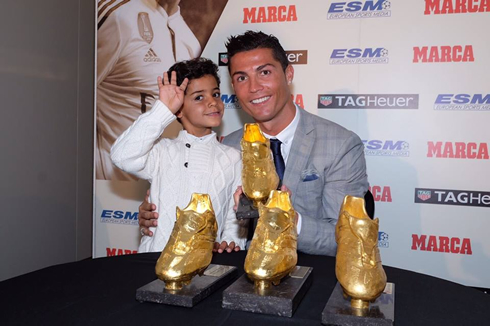 Cristiano Ronaldo: "In the beginning of my career, I never thought I would win 4 Golden Shoes. However and due to the chain of events that take place throughout your life, most times you end up setting up new objectives. It's never my primary goal, but as the season unfolds and people around me start encouraging me to keep scoring, it naturally becomes something I also end up pursuing," recognized the 30-year old. Much has been said about how Cristiano Ronaldo turned into a different type of player ever since he joined Real Madrid in 2009. He's scoring a lot more goals these days, but it's also true he's dribbling and showboating a lot less than he used to. Ronaldo: "I'm a different player nowadays. I play a lot more near to the box and I don't go running on the wings as much I did before. This change came naturally to me because it simply allowed me to start scoring even more goals. I also improved my instinct and nose for goal, and that's something that comes with time and experience. Over the years, I've evolved into a different type of player", assumed the Portuguese legend. Cristiano Ronaldo: "I want to keep winning things in Madrid and I feel great to be where I am. I might be 30 now, but I still feel young and I plan on still playing at least 5 or 6 more years at the level I've been at in the past seasons. I'm well aware it's going to be more and more difficult, but in my mind, I'll always think it's possible. I want to be a winner and I'm in the best club possible to do that. My contract will run out when I'm 33, but like I said several times in the past, I feel good here and it would be a dream to finish my career in this club", revealed the former Manchester United player, as he ruled out the possibility of a move to another club in the short-term. 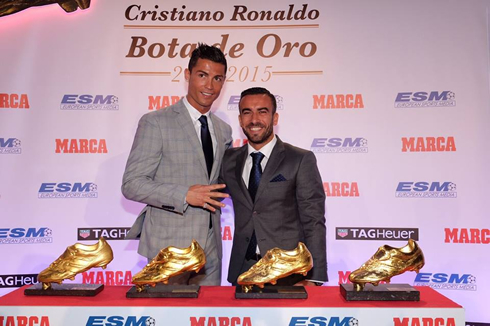 Ronaldo: "There are many great forwards in Europe and not just in Spain obviously. There's Messi, Rooney, Aguero, Lewandowski, Neymar, Benzema, Suárez, etc. I just feel extremely honored to have had the chance to win this trophy in 4 different occasions. Now I want to win more, but we'll just have to be patient and see what happens during this season...", concluded the Real Madrid star. Cristiano Ronaldo next game will be for Real Madrid, on the 17th of October of 2015, against Levante. You can watch Juventus live stream, Real Madrid vs Levante, Barcelona vs Rayo Vallecano, Everton vs Manchester United, Watford vs Arsenal, and Manchester City vs Bournemouth, all matches delivered in our soccer live section.